I live and work primarily in Derbyshire and Leicestershire, but that doesn't mean that I don't travel for work - quite the opposite in fact. I'm often out of the county and I love taking a new look at a venue I've not worked at before. 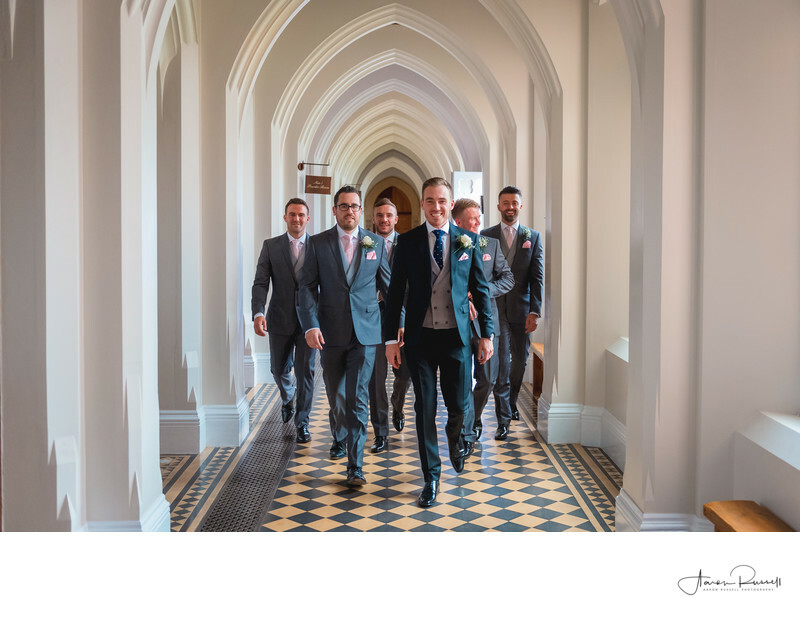 Stanbrook Abbey in Worcestershire was one such venue, and it's absolutely breathtaking! Patricia and Chris had their whole wedding there, including the getting ready stages, the ceremony and the reception too. With both the bride and groom getting ready at the same location, there wasn't the worry that either party would be late, but it also made it an easy process to photograph them both on their own respectively. One of the highlights of Stanbrook Abbey (and there must be hundreds of good talking points here!) is the cloisters, the stone floored corridors that have existed for hundreds of years. The corridors are long and wide and usually have windows down the one side, flooding the area with beautiful natural light. This photo was taken in one such location. Behind the groom, at the end of the corridor and to the left is the groom's parlour which is where all of the groomsmen had got dressed that morning (and consumed an amount of whiskey too!) and their pre-wedding reception was being held in the piano bar, a walk of some 60 or so metres. I positioned myself at the furthest end of the cloisters corridor, with my back facing the piano bar, meaning that the groom and his ushers would all have to walk towards me to come and greet the guests. I used a medium telephoto lens that allowed me to focus in on the people in the photo, but made sure that I zoomed out enough that I could still show the viewer of these photos the amazing setting in which Patricia and Chris had chosen to get married. I really enjoy these dynamic photos, and showing people walking somewhere is a much more interesting photo than the same people in the same location, stationary, posed and not doing anything. Allowing things to play out naturally like this really does give you the best possible photo, filled with real emotion. Look at the smile on the groom's face - there's no faking that!